The right chair will make a huge difference to your sitting posture, health, comfort and productivity. What are the most important things to know? Weight rating – If you want to be sure that the chair is well made and safe check the chair’s weight rating. Adjustability – The more adjustability a chair has the more you can change it to suit your body. This means better comfort and posture. Chairs with few adjustments are less likely to fit you or support correct sitting posture. Avoid chairs which only have seat height adjustability, or a fixed height backrest. Size and shape – A chair should fit your body. Sitting in the wrong shape or size chair will result in your body forward or, your back slumping and perching on the seat instead of sitting back into it, This means matching the seat size and shape to your legs and hips and the backrest size and shape to your back and shoulders. Armrests – Can cause problems because they block the chair from getting close to the desk. If you would like armrests the height adjustable type are generally best. Quality – Many chairs become uncomfortable or break because they have poor quality parts, foam and mechanisms. Generally, the lower the price the lower the quality and expected life. This may be ok short term, but the chair may quickly become uncomfortable or break. On the other hand, a well made chair can last for many years. The true cost of a chair should be calculated over its life; a $500 chair is less than $1 per week over 10 years. Castors – Ever gone to sit down and the chair has rolled away? Friction and self locking castors or even glides are the safest option on smooth, polished floors. Choose the right seat size. When sitting in the chair there should be 2-3 fingers widths between the front edge of the seat and the knee. Too much shorter than this will not provide adequate sitting weight pressure distribution and longer than this can affect lower leg movement or put pressure behind the knees. The wrong seat is a common mistake and will cause problems for your legs, sitting comfort and even back posture. Choose the right backrest size and shape. This is critical for good posture and spinal health. The wrong backrest can lead to slumping and back pain. It should ideally follow the shape of the spine and support the curve in the lower back. 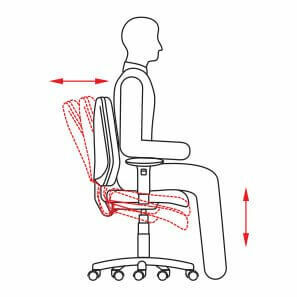 People with deeper low back curves should look for chairs with more pronounced low back cushioning or even pump up cushioning. The correct backrest for your back should make it easy to sit in a good posture. Check the chair height. Make sure the chair seat allows you to sit with your elbows level with the top of your desk. If when sitting at this height your feet are not firmly on the floor you will need a footrest. If you are using a computer, check that the backrest angle sits you upright enough, and can easily reach the keyboard without your arms needing to reach forward.